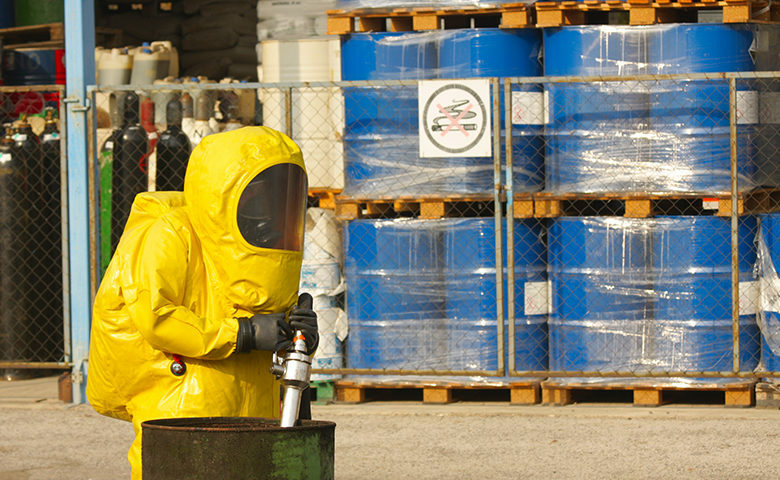 When working with hazardous substances, materials or energy, organizations are required to prevent or control incidents that have the potential to release these hazardous materials or energy and result in a fire, explosion, chemical spill, toxic gas release or other catastrophes. This is done by applying good design principles, engineering and operating practices in the systems and processes that are intended to handle hazardous substances. Addressing process safety prevents serious injuries and illnesses, property damage, lost production, and negative environmental impact. Organizations need to be compliant with OSHA’s process safety standard and should familiarize themselves with its guidance documents. But below are some basic guidelines for safety process management to get started. Information about hazardous substances must cover, among others, toxicity, exposure limits, and physical and corrosivity data. Information on technology must include a block flow diagram or simplified process flow diagram, maximum intended inventory, and safe upper and lower limits for temperatures, pressures, flows or compositions. Information on the equipment must include subjects such as piping and instrument diagrams, ventilation system design, safety systems, and materials and construction. A more extensive list is available here. A process hazard analysis (PHA) or evaluation is an organized and systematic approach to identifying and analyzing the potential hazards associated with the processing or handling of highly hazardous chemicals. It evaluates and analyzes possible causes and consequences of fires, explosions, releases, and spills of dangerous and flammable chemicals by focusing on equipment, utilities, human actions and external factors. The PHA should be performed by a team with expertise in engineering and process operations. This team should include at least one employee experienced in the process being evaluated and one employee knowledgeable in the specific analysis methods being used. Whatever the findings, the organization must address them promptly. If there are recommendations that need to be addressed, the employer has to take action on them in a timely manner and document it, including a schedule of when certain steps have been taken. Additionally, all affected workers have to be notified. All process hazard analyses must be updated and revalidated at least every five years to ensure that the hazard analysis is consistent with the current process. In addition, all hazard analyses, updates/revalidations for each process, and the documented resolution of recommendations are to be kept on file. When working with chemical processes, employers must develop and implement safe work practices to allow for the control of hazards during work activities by regular personnel or contractors. To allow for this, employers must ensure that operating procedures are reviewed regularly, especially if there are any changes in chemicals, the technology, or facilities used in the process. In addition, they must certify annually that the procedures are current and accurate. The written procedures must also be easily accessible to employees working with the process. When developing analyses and procedures, organizations must consult with their employees on all the elements of process management. A comprehensive and effective training program is vital to enhancing employee safety. All employees involved in any chemical process must be trained in the hazards of the process, emergency operations, and other practices that apply to the employee’s job. Refresher training must also be provided every three years (at the very least) to each employee involved in operating processes. It’s important to remember that refresher training might be necessary more often than every three years and the frequency of such training should be determined in consultation with employees. Employers need to keep a record of the training, which should contain the identity of the employee, the date when training happened, and the method used to verify the employee’s understanding of the training. When providing training, employers should consider how human factors might affect employee learning or the overall safety program. Human factors are an important part of the process analysis and not addressing them during training would mean ignoring a large part of everyday work performance. Addressing factors such as rushing or fatigue is vital in industries where a wrong move can end in disaster. Providing employees with the tools to recognize these states of mind and address them successfully can dramatically reduce the number of errors in the workplace. It can also prevent serious incidents from affecting employees, their workplace and their community.